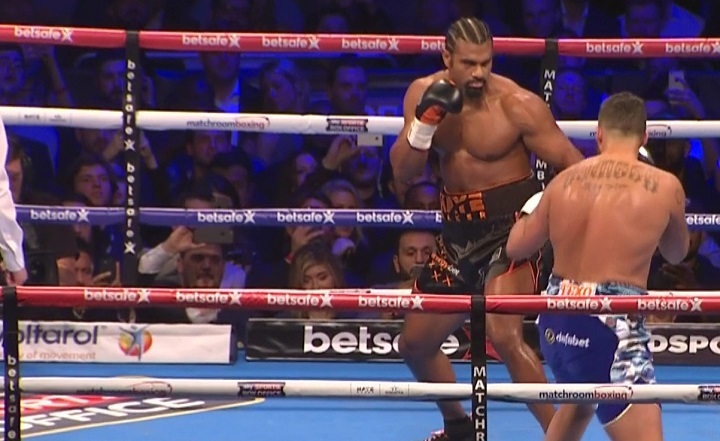 David Haye has been forced out of the rematch with Tony Bellew after tearing his bicep in training. Haye and Bellew were set to renew hostilities again at The O2 in London on December 17 following their rollercoaster first meeting in March won by Bellew, but the two teams will now work towards a new date for the rematch early in 2018, with news on that to come this week. “I am devastated to announce my much-anticipated rematch against Tony Bellew has been postponed until March 24 or May 5, subject to scheduling,” said Haye. “Despite the recent injury rumours, I was in perfect condition with an incredibly strong training camp, currently weighing lighter than I have for more than five years, I couldn’t wait to get back in the ring. I was ready to rewrite the ending of the Haye Bellew saga. “Unfortunately, after a freak accident during a stair conditioning session, which I’ve done with no incident hundreds of times, I lost my footing, slipped, so instinctively grabbed the bannister to stop myself toppling down the stairwell, in doing so I somehow managed to damage my bicep in the process. This afternoon I underwent a procedure to repair it, this was pretty straightforward and my doctor and physiotherapist have no doubt that not only will I make a full recovery but will be able to be back in the gym to start my arm rehabilitation in two weeks. “I’m gutted that the rematch with David has been postponed, both for myself but more for the fans,” said Bellew. “I’ve had a tough camp with a lot going on in my life but was ready to repeat my win from March. Fans who bought tickets for the event should visit their point of purchase for a refund or exchange for any new date for the fight.